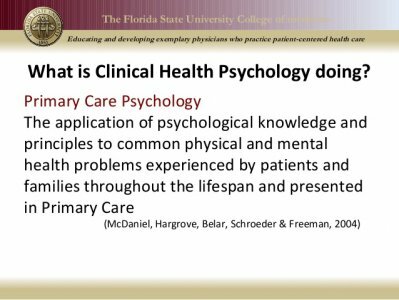 Clinical health psychologists use scientific knowledge to determine the relationship between physical health and behavior. They consider biological, social, and cognitive factors when assessing patients. These psychologists, in addition to evaluating and treating the symptoms of individual patients, may also work educating larger groups of people and teach them about physiological elements of health. Community education on health issues, such as teen pregnancy or drug or alcohol abuse, may be part of the job as well. Aspiring clinical health psychologists may begin their careers by earning undergraduate degrees. While a bachelor's degree in psychology may be preferable, it's possible to gain entry into a psychology graduate program with a number of different backgrounds. For students that do not major in psychology, graduate programs in this subject often require completion of coursework in psychology and statistics. Prepare for graduate admissions. Admissions to a graduate psychology program can be very competitive. Students can increase their chances of being admitted by maintaining high GPAs. In fact, some schools prefer applicants who have at least a minimum GPA, such as 3.25 on a 4.0 scale. Additionally, applicants are often required to take the Graduate Record Examination (GRE) and the graduate school may only accept candidates who rank in a top percentile for this exam. Gain practical experience. While experience is not mandatory for being admitted to graduate psychology programs, some admissions boards prefer applicants who have some form of experience related to psychology. Undergraduate students can gain such experience by taking paid or voluntary positions in clinical or research settings. What Is a Positive Correlation in Psychology?